That is the premise of this book. 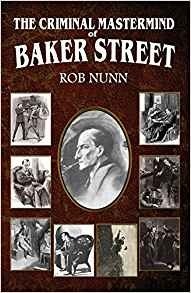 Nunn has taken the entire canon, including the cases mentioned in passing by Watson, but unrecorded. He even brings in one of the stories from Doyle’s Tales of Mystery and Horror, The Lost Special!” Each adventure is woven into the story from the viewpoint that Holmes masterminded them with Watson as a Lieutenant in Holmes’ operation. Granted, Holmes occasionally aides Lestrade on a case. It’s usually because the crime was committed without his permission or to punish a gang member that has underestimated Holmes. He takes the occasional case for Mycroft, who knows Holmes is crooked but prefers to ignore him unless it affects the Crown. The rivalry with Moriarty is still there and the clash at the Reichenbach Falls still takes place. It has the same results, except that Watson endeavors to hold the group together until Holmes returns. It really is a well thought out plot and the inclusion of some many cases doesn’t stop the flow of the story at all! Nunn has been extremely successful in his makeover of the Holmes canon. The one problem I can see is that it may be difficult for Nunn to continue his universe in more volumes. So many of the unrecorded cases are used, that only a few remain. There are a couple more tales from the TOMAH book that would work, so here’s hoping!